HP introduces HP Z Workstations ideal for customers in CAD, architecture, video/photography editing, oil and gas, animation, medical and mechanical computer-aided engineering. HP today introduced new multicore updates and increased expandability on its powerful line of HP Z Workstations. The new workstations feature the latest eight-core Intel® Xeon® processor E5-2600 product family, offer up to 512 gigabytes (GB) of DDR3 memory, and support multithreaded workstation applications that professionals rely on. • Engineered for the most demanding and compute-intensive visualization needs, the HP Z820 is ideal for customers in oil and gas, mechanical computer-aided design (CAD), mechanical computer-aided engineering, medical, video and animation. The HP Z820 provides up to 16 processing cores, up to 512 GB of ECC memory, up to 14 terabytes (TB) of high-speed storage and up to dual NVIDIA Quadro 6000 graphics. • For quiet environments with minimal space, the HP Z620 is a great choice for customers in financial services, video, animation, architecture and midrange CAD. Updated to support both single- and dual-socket processors, the powerful and versatile HP Z620 provides up to 16 processing cores, up to 96 GB of ECC memory, up to 11 TB of high-speed storage, and up to NVIDIA Quadro 6000 or dual NVIDIA Quadro 5000 graphics. • Engineered to meet mainstream computing and visualization needs for customers in CAD, architecture, video editing and photography, the HP Z420 includes up to eight processing cores using the latest Intel Xeon processor E5-1600 and E5-2600 product families, providing up to 64 GB of ECC memory, up to 11 TB of high-speed storage, and up to NVIDIA Quadro 5000 or dual NVIDIA Quadro 2000 graphics. The Intel Xeon processor E5-2600 product family allows for up to 16 physical cores in a single system and lets 32 threads run at one time when using two processors, each with eight cores and Intel Hyper-Threading Technology enabled. The new processors include Intel vPro™ Technology, integrated memory controllers and Intel Turbo Boost Technology. All HP Z Workstations offer BFR/PVC-free configurations and are more than 90 percent recyclable by weight. 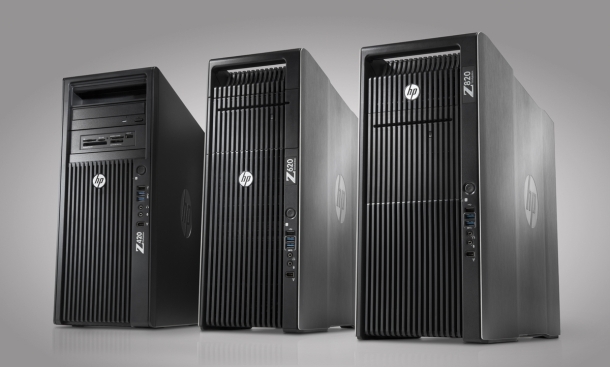 The HP Z420, Z620 and Z820 Workstations are expected to be available worldwide beginning in April. Estimated U.S. pricing starts at $1,169 for the HP Z420, $1,649 for the HP Z620 and $2,299 for the HP Z820. HP offers flexible financing solutions for customers deploying the latest HP Workstations through HP Financial Services, the company’s leasing and life cycle asset management services division.